Three of our looms, the 8″ Lani Loom, 12″ Little Guy Loom and 16″ Big Sister will now come two ways. The first way: WITH the shedding device and the second way: WITHOUT the shedding device. That’s that. The price will be reflected in whether or not you get the shedding device and, if you do decide not to, a shedding device can always be purchased separately. 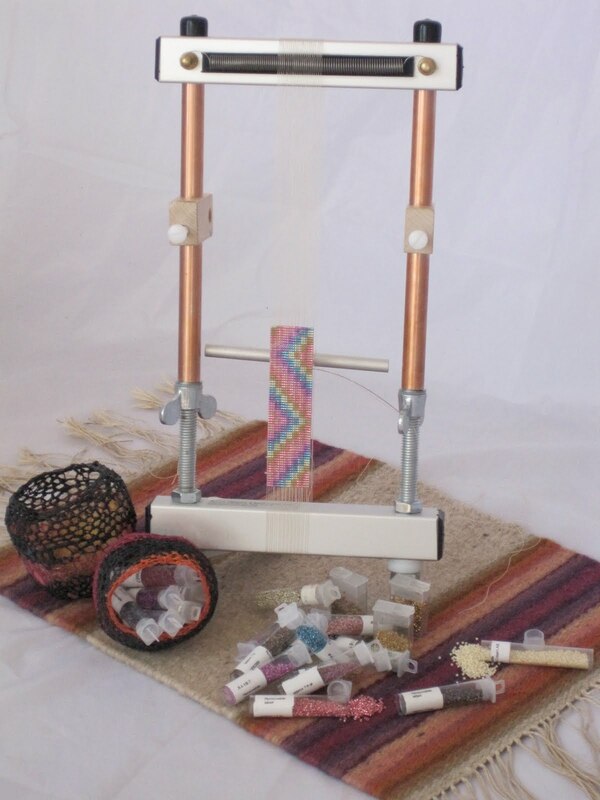 The 12″ Little Guy Loom without a shedding device will now be sold for $225.00 and the 16″ Big Sister Loom without a shedding device will be sold for $250.00. Please note that previously we were offering these looms without a shedding device but WITH a bottom spring kit at the same price. This option is no longer available, but the bottom spring kits can be purchased seperately. Behind everyone is the 22 inch loom. To the right and in front of it is the 16 inch loom sporting a tapestry. To the left of that is the 8 inch loom with half of the beaded cuff pastel bracelet (tomorrow I finish it . . . well, maybe not, but I’ll make a dent). And in front is hte 16 inch loom with the ipod kit in progress. 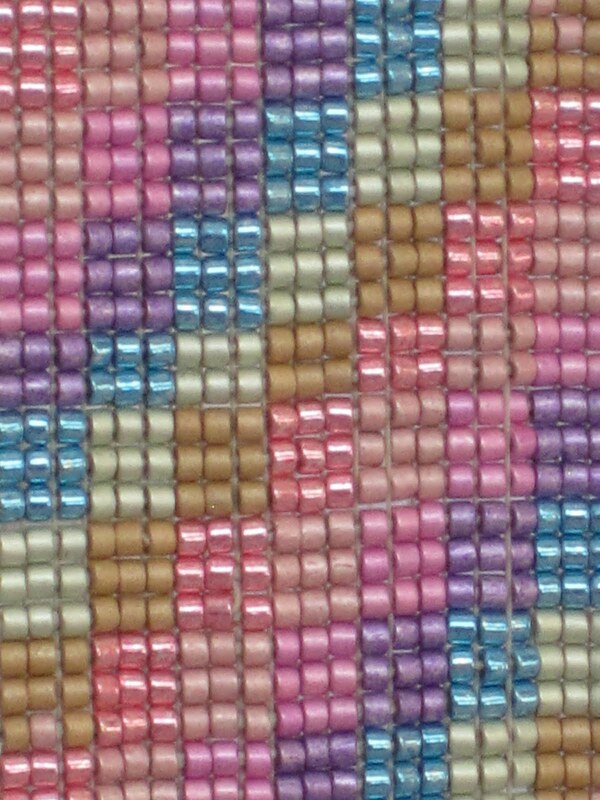 Close up of pastel bead weaving. Gotta love those colors! 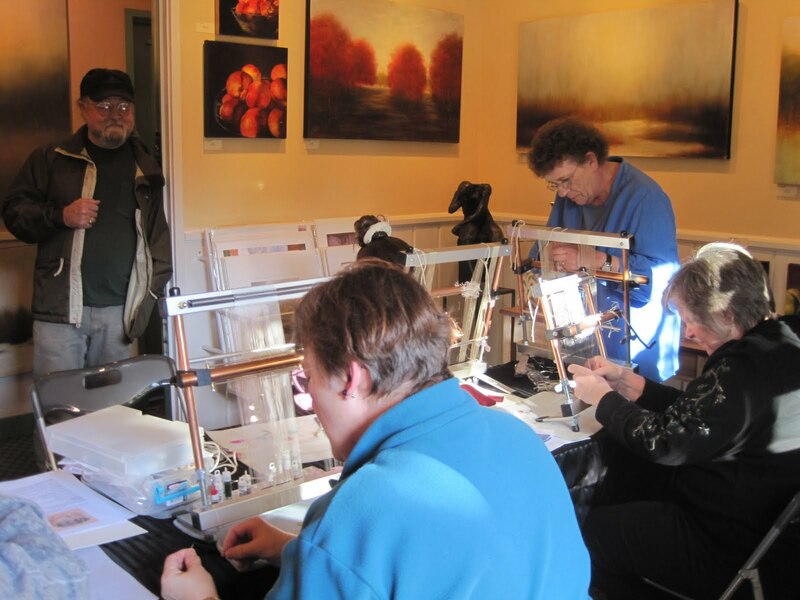 Back from Edmonds Washington where we held a Mirrix Workshop at Semantics gallery. 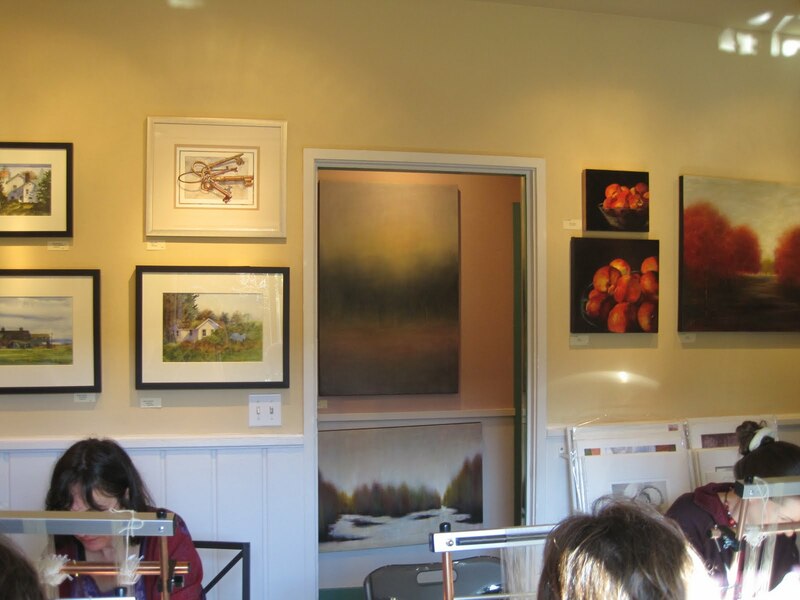 Nothing like being surrounded by gorgeous artwork for inspiration! That’s me below fixing something. Why is Debbie smiling? Because she’s looking at all those woven rows of beads. Success! 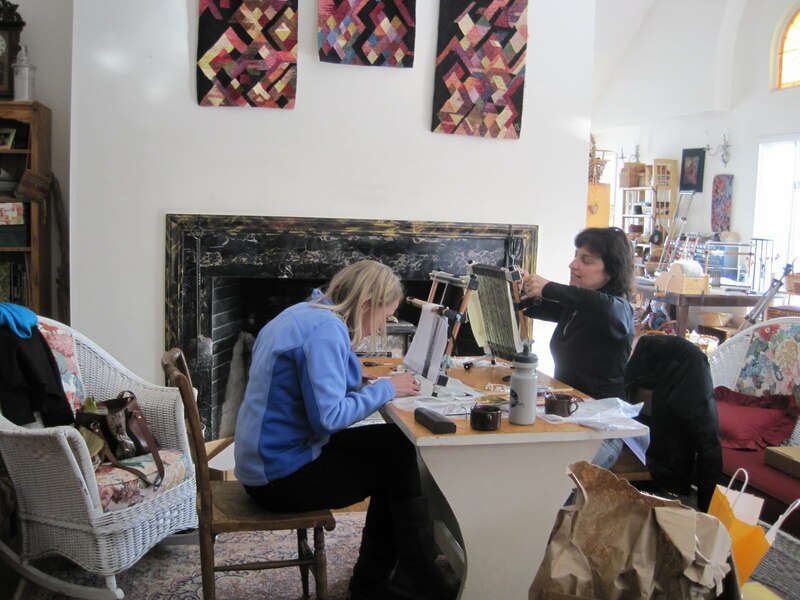 We had a follow-up workshop with Lisa and Nancy. Thought you might want to see what Lisa produced. Amazing! This is being woven using the shedding device. The piece is as wide as one can get on the 12 inch loom. 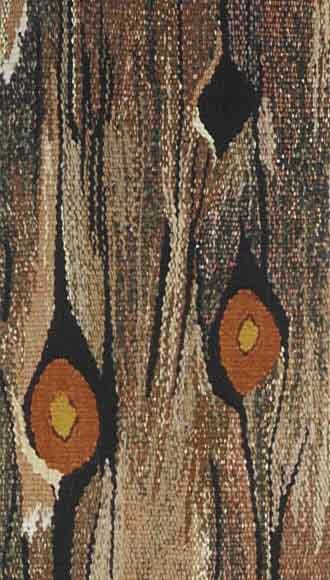 It is woven using Delicas and the standard Mirrix heddles. It’s perfect. 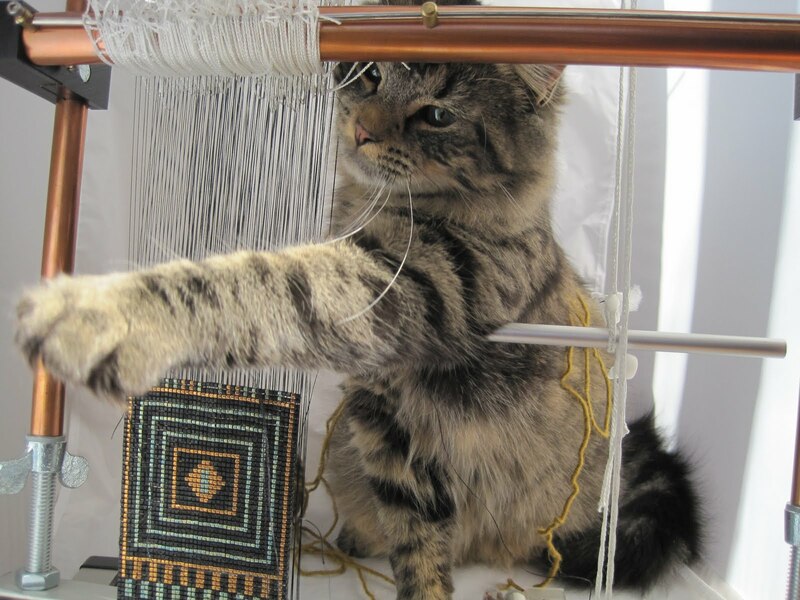 And then there is Franc again who once again decided to take up weaving. This time he’s working on the ipod kit. Or maybe he’s destroying it, but we won’t tell him that. Then he discovered the mini mirrix but there was no warp on it, so he didn’t get much weaving done. Lit a fire in the wood stove. Placed a table in front of the wood stove. 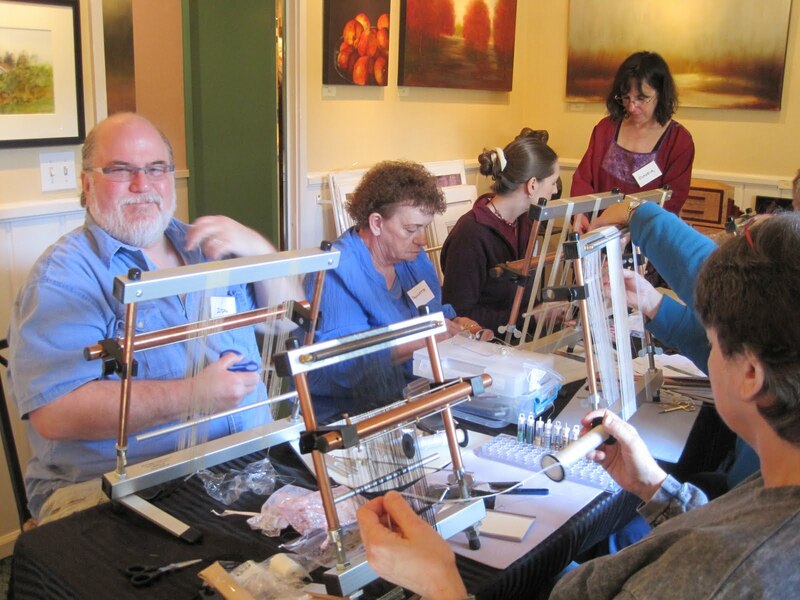 Ready to teach a workshop on bead weaving on the Mirrix Loom. Note the big smile on Lisa’s face. Nancy is smiling too, although you can’t see her face in the bottom picture. She was thrilled with her piece. They are coming back in a couple of weeks. Maybe next time I’ll get some shots of Nancy’s beautiful face too! In the back there, sort of behind Lisa, is my actual studio, although it has spread out quite a bit. 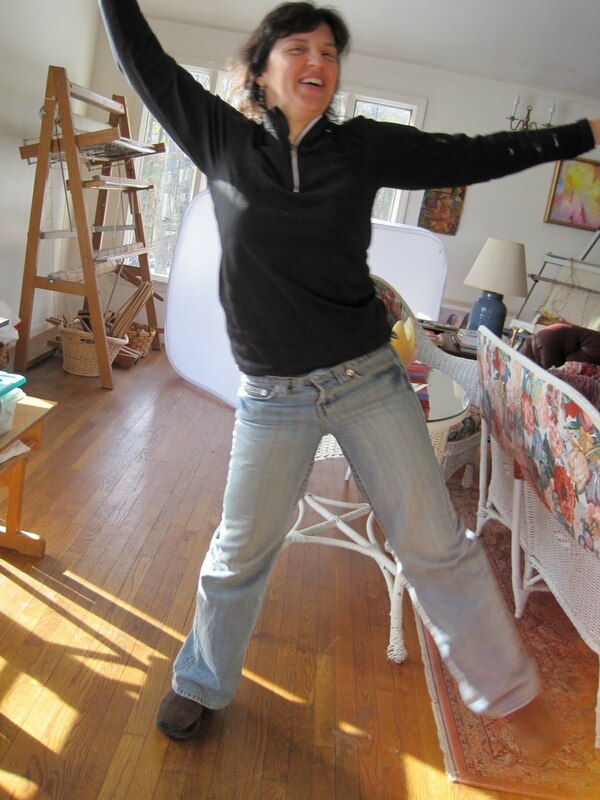 Below is Lisa’s “happy dance,” having just survived putting on the last heddle. Next, she had to weave in that first long row. That took a while. We encountered a few problems, fixed them, looked at the clock and went into a slight panic because they had to leave at four. 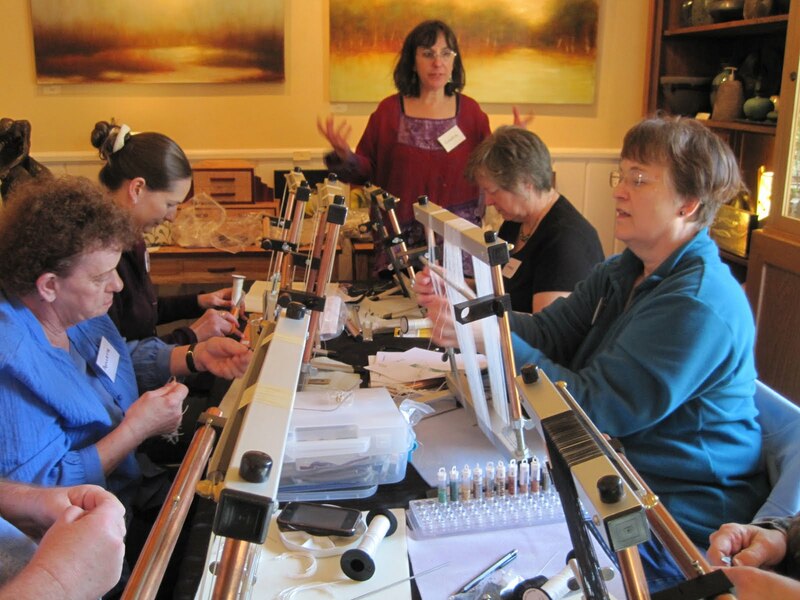 I have never so much wanted a workshop to not end and I especially wanted Lisa to get in a fewmore rows. Nancy was just humming along with her piece, happy as can be. Maybe that’s why I never got a photo of her face because she just wouldn’t look up from her weaving. And every post really should end with a picture of Franc the cat who made himself present and known the entire time. We got two days off (well, really one and a half). We spent two nights in Stowe Vermont. Nice camp ground, sweet little shelter, no bugs. This is all good. And I had my beadwork with me. So I said to Rick (husband, on right) let’s not hike Mansfield because something a little smaller would be better. Okay, he says. So, we hiked Spruce Mountain instead. Five and a half hours later we were done. I mean done. Mansfield would have taken five hours. It’s steeper but a lot shorter. But I should know my husband by now. I should know that there is no such thing as a short hike. Oh, and then he wanted to take a little paddle in the canoe (that would have been an hour long paddle full speed). Gotta leave some wake behind. But the sky had the good sense to fall in rain drops, so we nixed the canoe moment and headed home. I did make an off-loom piece which I will post if I get the inspiration. I left my Mirrix home. Sometimes you just have to leave even your Mirrix behind. For a variety of reasons, including the fact that I have not woven something large with beads on the Mirrix for quite some time, yesterday I decided to weave our “ipod” kit. I love this piece. I’ve woven two already, but gave them both away. I decided that my blackberry needs a new, beautiful house (this purse fits most cellphnes, ipods, you name it). Also, I needed to warp the loom for a larger piece, remind myself that I love this loom and why so I can communicate this information to my customers. So I am going to take you on this journey, which had some snags in the beginning, which I will share. In fact, I will share all the good and all the bad (mostly it will be good). The kit itself comes with a multiple page version of this pattern. The piece itself is ten inches long and about three inches wide. It gets folded to have a flap. 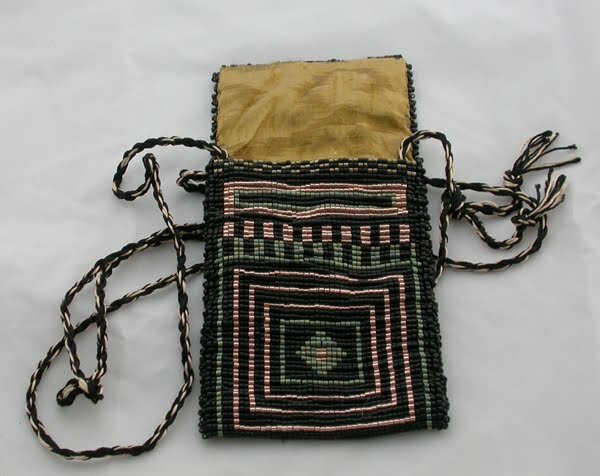 A rope made from rayon is included with kit but you can also bead your own strap since there are extra beads added for this purpose. I warped the loom. I am good at this having had a bit of practice! Put the heddles on with no problem. Put in the first row of beads, which was really, really easy because I was using the bottom spring kit. Started using the shedding device. Wove about five rows. Everything was working great and I was patting myself on the back for not having made an error attaching the heddles. Went over to a friend’s house for dinner. Returned for some more beading fun. And then I realized that I had forgotten to put heddles on one set of warps. Spent the next twenty minutes trying to fix this problem. Fortunately, the mistake was only about eight warps in. Still, I had to unweave what I had woven, remove all heddles in the way to get on new ones, replace all those heddles. After that, I stopped for the evening because the light was lousy and I was in one heck of an annoyed mood. But this is good because I was feeling exactly what one of our customers feel when things don’t just go swimmingly well. When everything is set up right, it does go swimmingly well and we forget all our troubles in bead land. But when we make a mistake and have to fix it suddenly all those thin threads seem like the enemy and the loom could easily be converted into a weapon or a football. Woke up this morning with a new attitude and before I even had my morning espresso I wove a few rows. No mistakes in heddle placement. Everything was right in bead weaving land. A not so great close up below but you can see the progress. Those rows took maybe ten minutes to weave and they just fell in place. What I love about the shedding device when weaving wider pieces is there is really only one mistake to make: forgetting to rotate the shedding device. You can tell you’ve done that when you get some funky side warps. They aren’t caught by weft thread. You see it pretty quickly. I did that once this morning but it was the last row I was weaving so it took only a moment to fix. The great thing is that you don’t have to remove beads to fix it. Just pull them back through the shed (that’s the space between the raised and lower threads). And even though when on the loom it looks like there are slight gaps between the rows, once removed from the loom the warp will shrink back to size and pull everything in nicely. There will be no gaps. I am going to keep taking photos and keep you updated on my progress with this piece. Will take photos of every aspect including finishing (my least favorite part). You will be able to but the kit for this bracelet in a day or two. I’ve made all the kits, just need to get it into our shopping cart. But meanwhile, I am uploading the pattern to this blog for those of you who would like to put together your own kit. You can use any of the Mirrix Looms to create this lovely bracelet. This piece can be woven with or without the shedding device. It’s your choice. Try Both! These instructions are for a bracelet 6 ¼ inches in diameter when on your wrist. Increase or decrease by three rows to add or subtract a quarter inch from the size of your bracelet. Make sure that there are sixrows after the button hole. 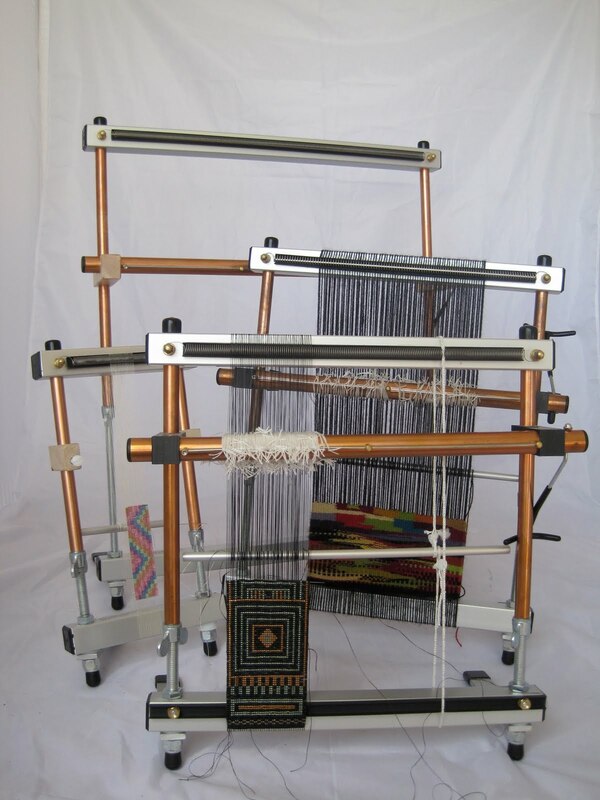 You will want to reduce your loom’s height to minimize the amount of warp you will use. 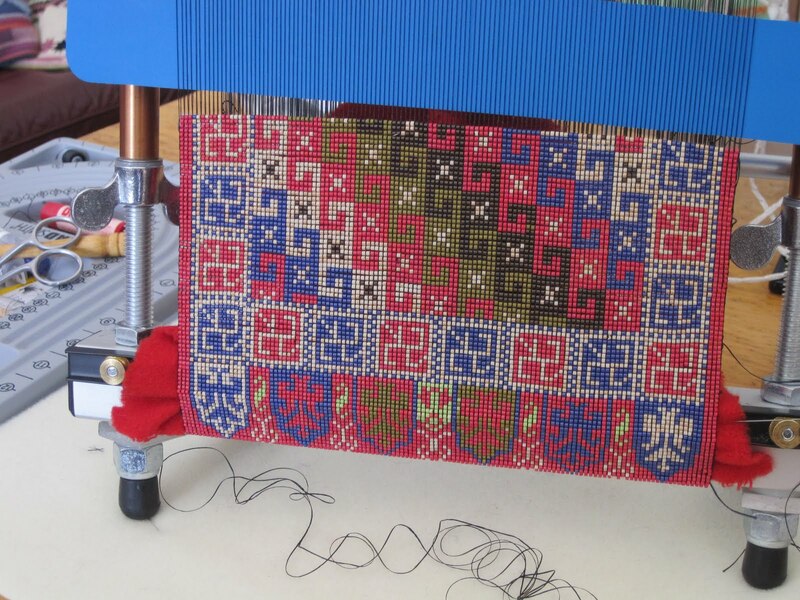 If you have a larger Mirrix Loom, this can be accomplished by using the extra warping bar. Use the 18 dent coil for this project if possible. The 14 or 16 dent coils will also be adequate. You will need to have 13 warp threads. We have included a bead pattern to demonstrate the placement of colors. This pattern does not reflect the actual colors included in this kit. Do follow the placement of color in the pattern. 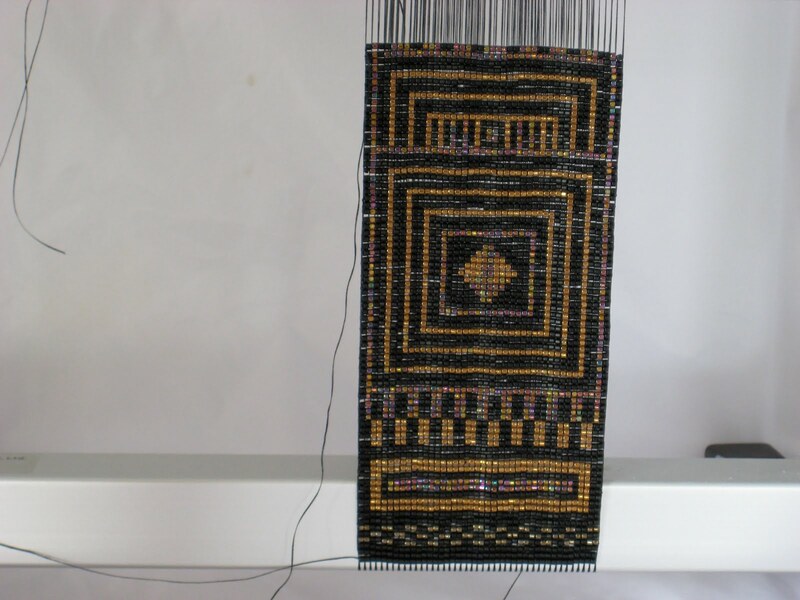 Place three piles of the different colored cylinder beads on a cloth in front of your loom. Cut a length of C-lon thread about a yard long. Tie the end of this thread to the bottom of the left threaded rod on your loom using a slip knot so that you can easily release it and weave it back into your piece later. Beginning with the first row, pick up three blue/green beads, three gold beads, three blue/green beads and three gold beads. Weave these beads. Repeat this pattern for two more rows. The next row will comprise three green beads, three gold beads, three green beads and three gold beads. Repeat for two rows. The next row will comprise three gold beads, three blue/green beads, three gold beads, three blue/green beads. Continue this pattern of for 93 rows for a 6 ¾ inch bracelet. As I mentioned before, add or subtract three bead rows to add or subtract a quarter of an inch to your bracelet. Some adjustment can be accomplished by the placement of your peyote button. For the next section, keep the new color and replace the old color for nine rows. At row 94, you will need to create a button hole. Continue weaving with your current thread, but only go to column six (please see white line in enclosed pattern). Weave this section of only six columns for six rows. Start a new thread to weave the five columns on the other side of the bracelet. Weave that side for six rows. End one of the threads and continue weaving a straight row of checkerboard for six rows. 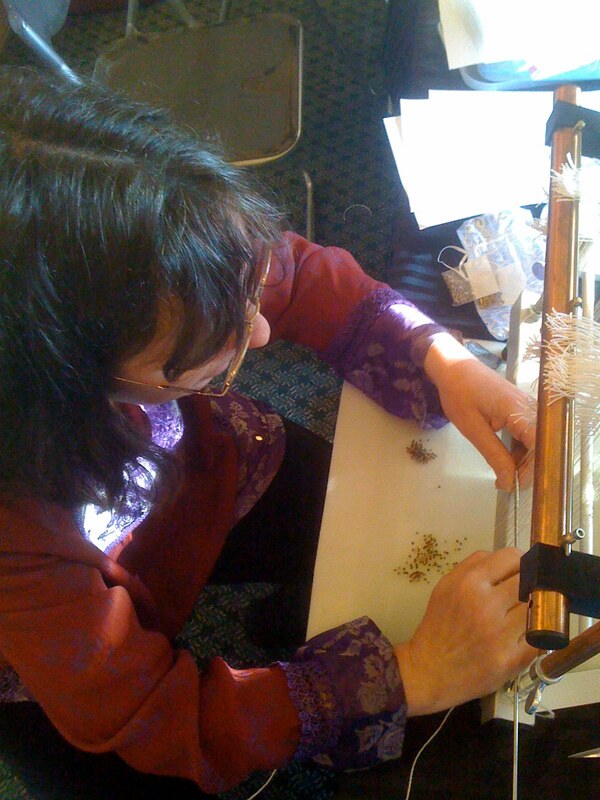 Next you need to weave in a header and a footer with the silk thread. Cut the thread in half. Thread a blunt nose tapestry needle. You will be weaving a half inch of this silk on either end of the bracelet. 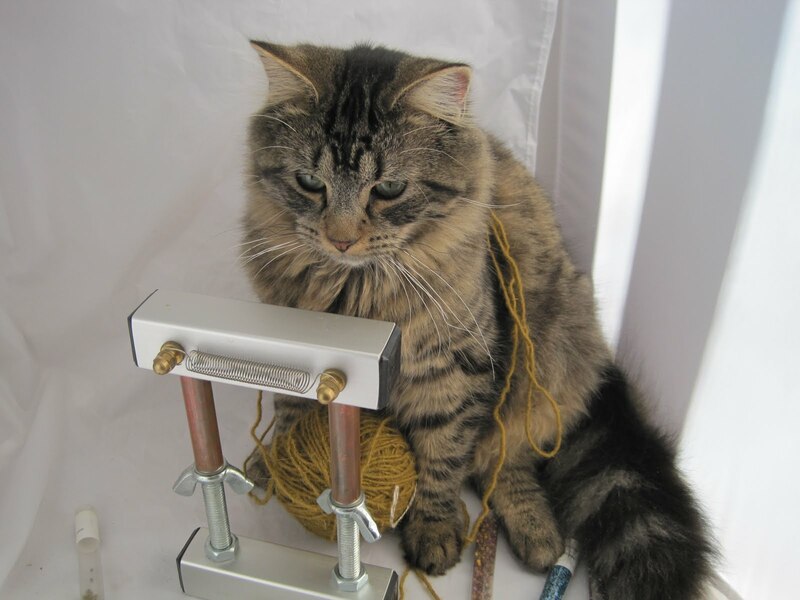 Using the needle, go under and over every other thread (or pairs of threads, if you have used the shedding device), then reverse direction and go under the threads you went over and over the threads you went under. After you have woven a half inch, sew both ends of the silk thread into the woven part so it does not ravel. 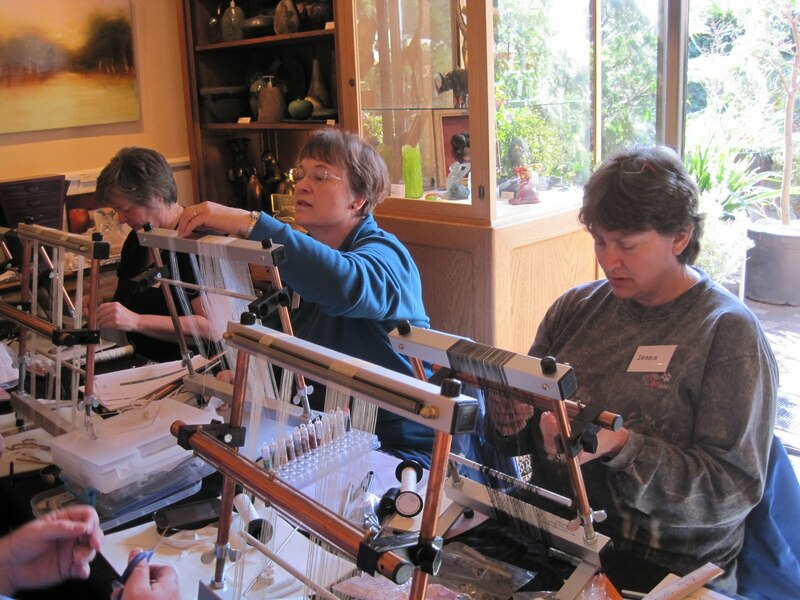 When you’ve finished weaving your header and footer, loosen the tension on your loom and slip out the warping bar. Lay your piece flat and trim the ends so that you have at least four inches left to work with. Tie overhand knots with warp pairs. When you’ve tied all the knots, trim the warp as close as you can without allowing the knots to be undone. Fold the header (or footer) at the seam where the header and beads meet. Turn the knots under so that they are buried. Carefully sew this header down so that you knots are buried and it looks neat. Do the same with the footer. This will be the back of your bracelet. You want to make this hem as sturdy and neat as possible. Make sure that you avoid covering the button hole. In order to add a picot edge to the sides of the bracelet, string a workable length of C-lon (a yard) and sew it through the beads at one end of the bracelet in order to firmly attach it. You will pass your needle through the last bead at the edge of the bracelet, pick up three 11/0 seed beads and then pass back through the next edge bead. Pass your needle through the next bead so that you are once again working on the edge of the bracelet. String three more seed bead and pass back through next bead. Continue this way until you have come to the end of the bracelet. If you have left over C-lon, work your way back to the other side of the bracelet and repeat this procedure until you’ve reached the far end. If you have only a short length of C-lon, string a new piece and firmly attach to bracelet. This edging is very attractive as well as reinforcing your bracelet and disguising the warp threads on the side of the bracelet. Using cylinder bead color of your choice to make a flat peyote piece that you will sew into a cylinder. Firmly attach the pearls to either end of the tube. String ten 11/0 seed beads. Make the piece 8 rows wide. Zip the first and last rows together to form a tube. Sew the tail back into the bead work. Use the left over thread to sew to the sixth bead in one of the rows. You will be sewing this button onto the bracelet at a point that creates the best fit for you. 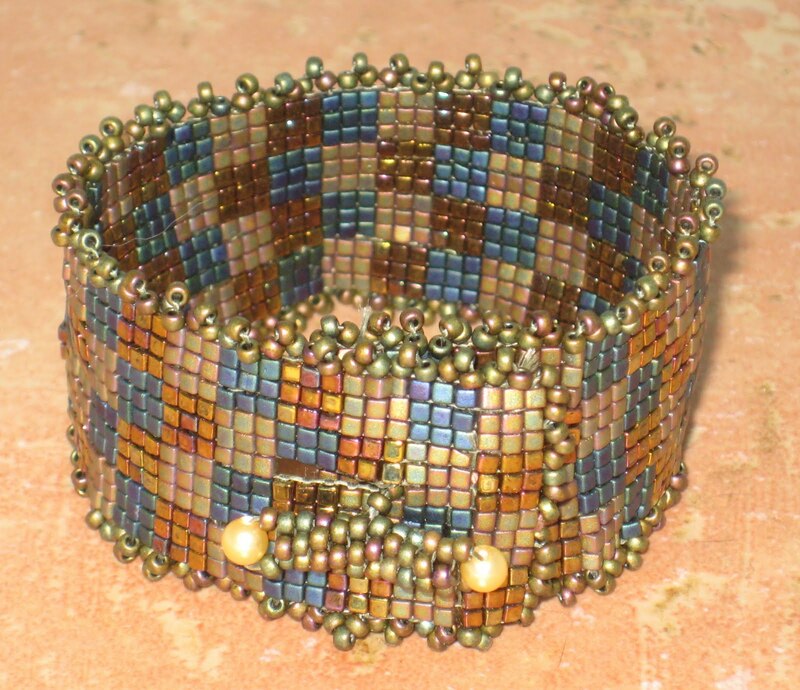 String up three 11/0 seed beads, sew onto bracelet, thread three cylinder beads, sew back through button. Or, if this is a gift: put it in the included gift bag and give it away! I haven’t woven (or should I say, finished) a tapestry in a very long time. 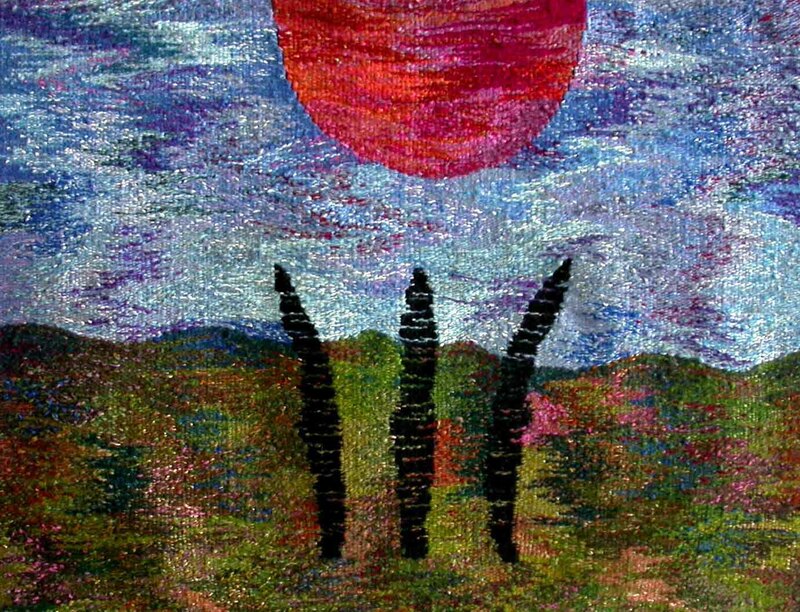 Inspired by a customer who just ordered the 38 inch weave to embark on tapestry (and bead weaving) after having in her past woven fabric, I decided I needed to look at some of my past tapestry images. So I picked ones that are nolonger with me. You don’t think you are going to miss these pieces when you sell them. You think: wow someone gave me money for that and it’s going to hang on their wall. Isn’t that great! But I miss them. The one to the right is called “Fragments. It was woven on a linen warp which was wonderful. The piece came off so rich and stiff and complete. loom it was like drinking a really expensive wine after only drinking cheap stuff for years. 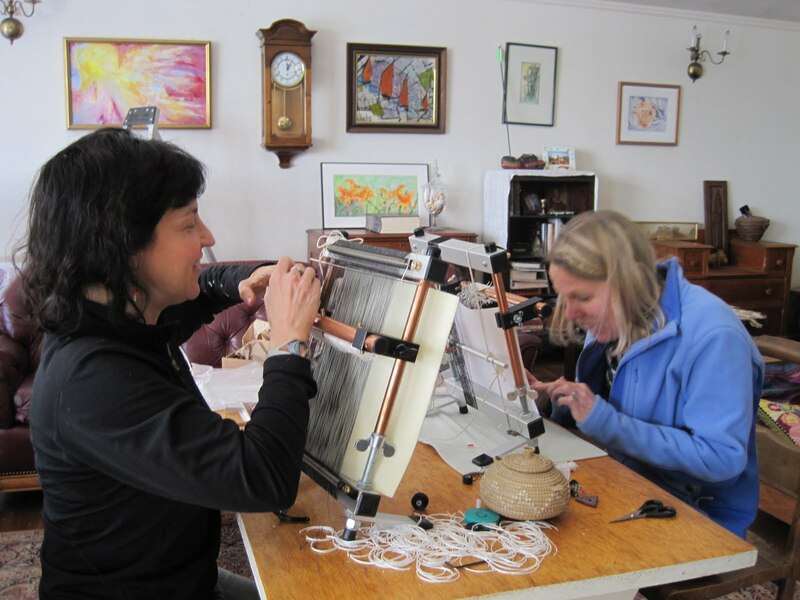 Tapestry weaving became magical and not nearly as difficult (this experience must have greatly contributed to creating the Mirrix so that others would have that great tapestry weaving experience without having to buy a huge and expensive floor loom). These pieces are not shown in order of their creation. This piece was also not woven on the Mirirx. It lives in a home in Wisconsin. Sold from a show I did there. Interestingly enough, the folks who bought it had me turn it sideways for them to hang (I had to change the bar on the back that I use to hang my tapestries . . . something for a future discussion). I wove a series of tapestries in this style. The diamond pattern was fun to weave and allowed for some surprising progressions. The tapestry below ended up in the office of the Church that also bought the set of tapestries below. Light of the World: These two hang side by side in a Church in Wisconsin. My first serious commission. The big challenge was to make sure the image flowed from one tapestry to the other. Our pond in Wisconsin (where I lived for four years and where I founded Mirrix.) 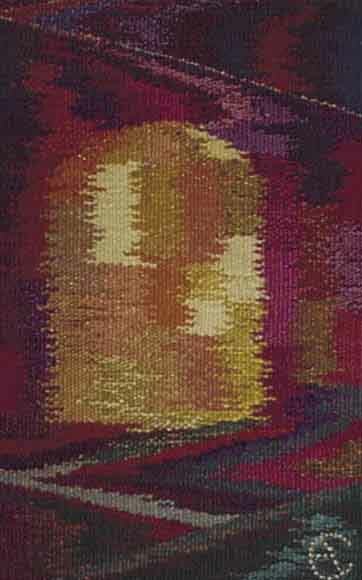 This was done on a Mirrix Loom. I gave this to my loom company partner at the time right before we headed back to New Hampshire to live. 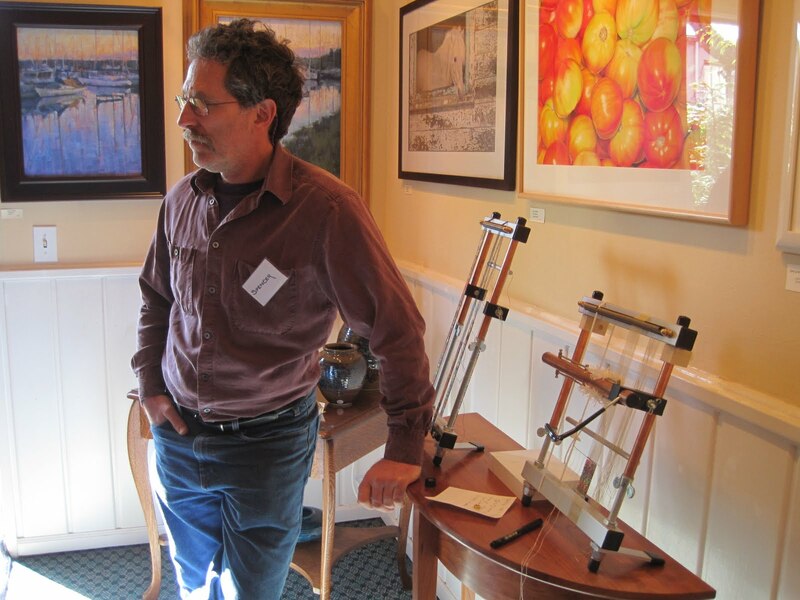 He is no longer my loom company partner but I suspect he still owns this tapestry. Acorns in a tree to the right. I don’t know who owns it because it sold through a gallery. This was a rare realistic piece. It was based on a tiny photograph I found in a Nature Conservancy magazine. The tapestry below is called “They worshiped the sun God.” It came out exactly as I envisioned it. I use a lot of weft bundles with strands of wool and rayon. The below tapestry is called Window, I believe. Again, it sold through a gallery so I don’t know where it now lives. Night Vision, below, lives a corporate headquarters somewhere in Boston. I forget the name! 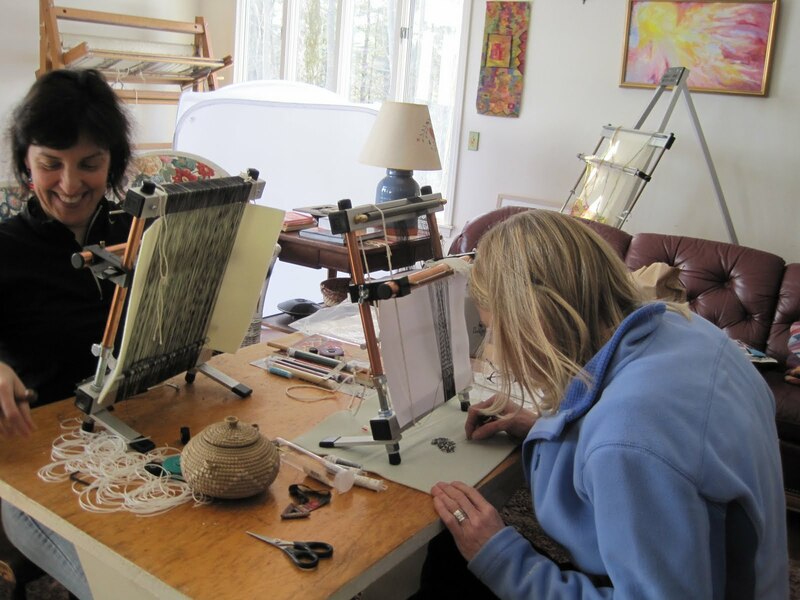 I began weaving tapestry with commercially dyed and spun yarn. 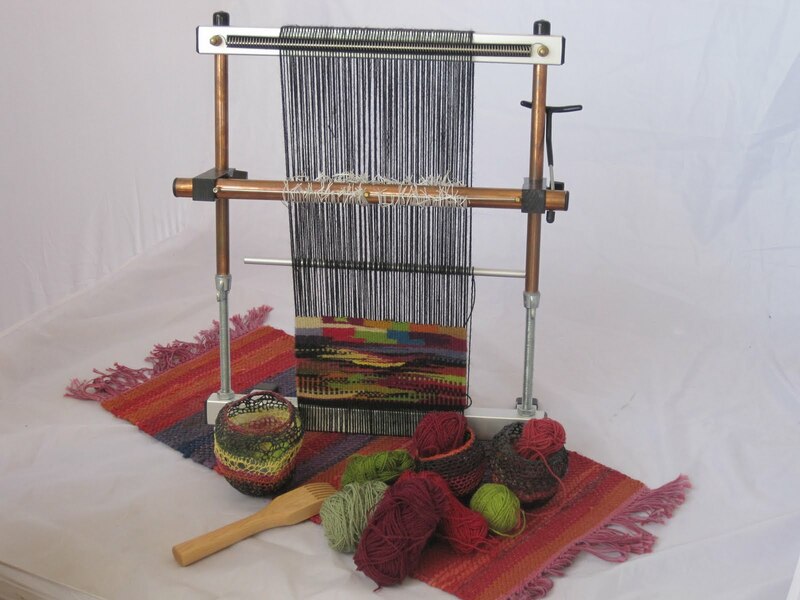 In order to make the yarns ”sing” I combined various weights and types of yarns together using the method known to tapestry weavers as weft blending. Eventually, I learned how to dye these yarns, giving me even more control over the final product. Still, a certain inner glow was missing from my tapestries. I wasn’t able to define what was absent until a student showed up to my class with a tapestry woven from her own color-blended, handspun yarns. 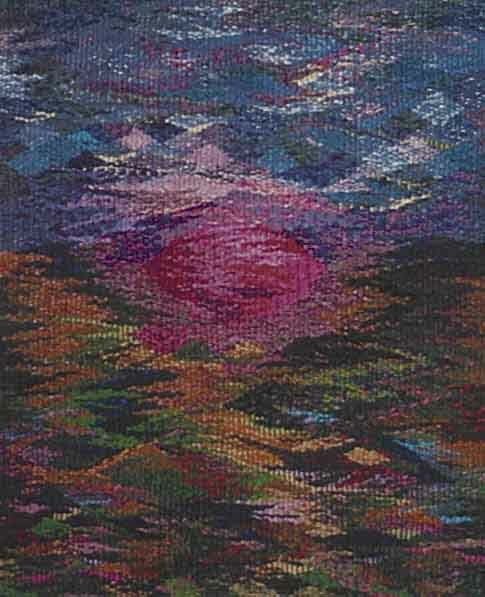 I was astounded by the muted, watercolor-like glow that emanated from her first tapestry. I had always said I would never learn to spin. In that moment I knew the choice was not mine to make. The next day I was the owner of a spinning wheel and a couple of pounds of Merino roving from a friend’s sheep. In the first week I learned two things: how to spin a yarn that was acceptable and why all fleeces are not the same. I knew I wasn’t spinning the right fleece for tapestry weaving but I had no idea what type of fleece was right. I asked a lot of questions before I understood which fleeces are appropriate for tapestry, how those fleeces should be prepared, and how to blend the dyed fibers for spinning. Since becoming a bonafied spinner I have discovered that the journey from fleece to yarn is as integral to the tapestries as the weaving itself. I have decided that certain long wools work best for my tapestries. I prefer Cotswold, but also enjoy Wendslydale and Lincoln. I usually blend these wools with mohair and sometimes little bits of Angelina fiber, which is a totally synthetic fiber that comes in a variety of colors and reflects light in a great imitation of nature. I both comb and drum card my fiber, depending on how well I want to blend the colors since there is a minimum of two colors of fleece in every yarn I spin. I use combs when I want each fiber color to be equally blended throughout the yarn creating a more uniform color appearance and the illusion of a solid color. The drum carder is useful when one wants a more uneven distribution of color and a more variegated looking yarn. The best method for becoming comfortable with color blending is to practice with small amounts of colored fleece just using hand combs or cards or even you fingers. Start with closely related colors and then throw in a color from the other side of the color wheel. Because the fiber colors do not bleed together like paint, your chances of coming out with mud are non-existent. Gradually add colors, being mindful simply of whether or not the results look good. You can often correct a bad color choice by adding a neutralizing color from the other side of the color wheel. Break out of your familiar color traps by combining three colors that you think will look hideous together. You will find that often the results are better than anything you could have planned. The goal is to experiment with tiny quantities of fiber until you have created a bunch of sample blends. Spin it all up and see what worked and what did not. The final test is weaving this yarn because even an apparently ugly yarn can work beautifully in small quantities in a tapestry. 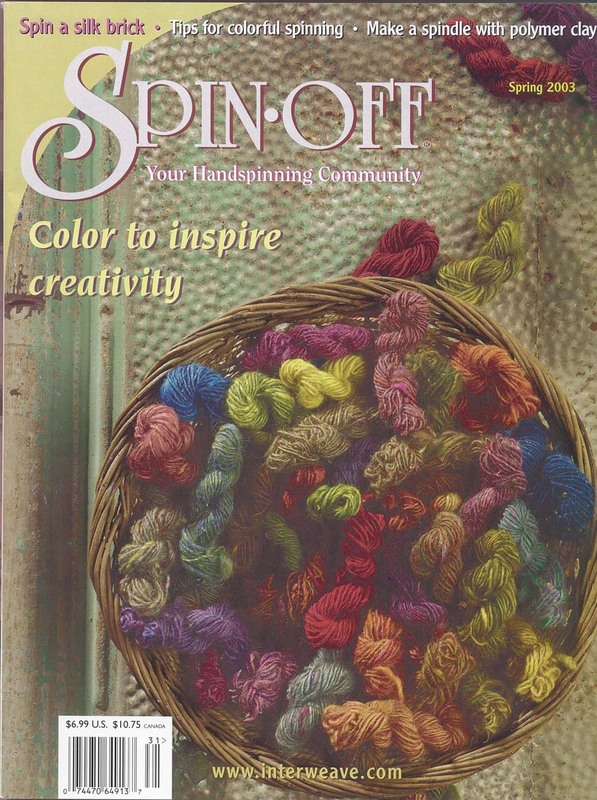 The gift is that as a spinner you can mix your own paints, exerting complete control over the colors in your weaving. Tricks are great for becoming comfortable working with color, but learning how to see the colors that exist all around us is imperative. Nature is the single best source for this knowledge. Not only does nature provide a perfect assortment of color combinations, but she also showers these colors with an ever changing light show. Matisse used to paint the same scene again and again as the light changed. The colors in each of the paintings from a series are radically different from one another. The experiment is easy to do. Find a patch of nature that appeals to you and watch it for an extended period of time and at different times. Randomly choose to really look at color combinations in nature. Why does that bright red flower look great against the kelly green spring grass? I was always told that yellow greens and blue greens don’t go well together and yet nature is a riot of such green combinations. 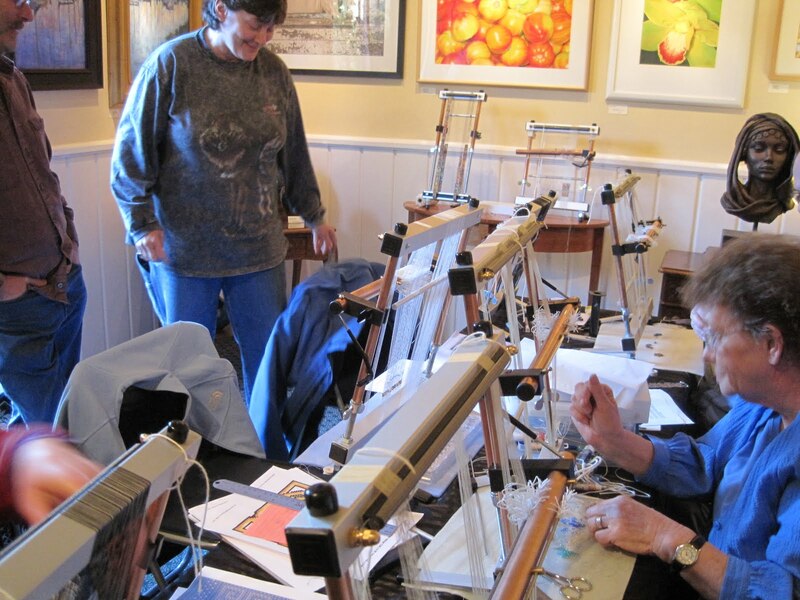 I recently received feedback from a student during the last class of a tapestry and bead weaving workshop. She had just returned from a trip to the Bahamas. She was determined to look at the colors of nature while on this trip to inspire the final project for the class. She choose the moment of sunset to watch the colors change above and across the water. She watched it intently every day for a week. 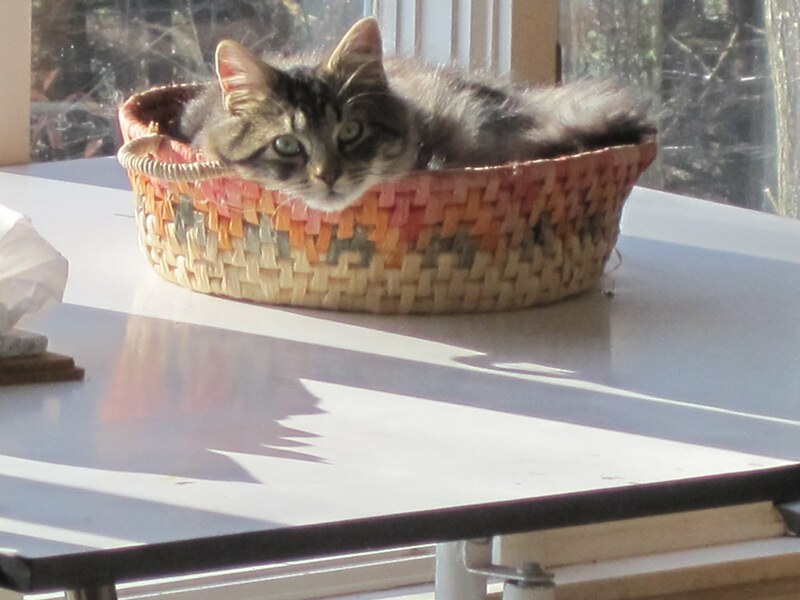 When she showed me her final weaving I was stunned. The little flecks of orange and red and yellow and green exploding in a literal sea of blue shading into a lighter blue brought me right to that beach at sunset. There was no sun in her piece. There was just the magic of color that the sun shakes off into the sky and water right before it leaves. It’s a magic all of us are capable of both seeing and recreating.